A Virtual Knowledge Train on air quality and climate change science has been developed in the frame of an EU-funded (2004-09) Network of Excellence (NoE) in Atmospheric Composition Change (ACCENT; www.accent-network.org). ACCENT is composed of about 1000 scientists in Europe and beyond. 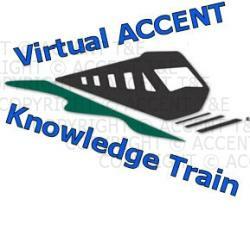 The ACCENT community provides the scientific content for the Virtual Knowledge Train, and collaborates with a team of educationalists and e-learning specialists on the dissemination of the web-based material. The activities are coordinated by the University of Berne (PD Dr. Evi Schüpbach) who has also served as a Member of the ACCENT Managing Committee since 2004. The web-based tools and material in ACCENT have been developed for both schools (teachers, pupils) and the public, and universities (postgraduate students). All material is free to use, and available online on the ACCENT Educational Platform. The material for schools and the public is a valuable source of information on air quality and climate change science. The content is multilingual (European languages, Russian) in order to address the pupils and the public in their own mother tongue. The web-based material for postgraduate students provides up-to-date teaching material on burning issues in the field of air quality and climate change science. The e-learning modules can easily be incorporated in existing curricula at universities, and offer a broad range of feed-back, tests and exercises. About twenty editions are now online, available in English, French, German, Greek, Italian, Spanish and Russian. Each edition is structured in five sections (research, context, activity, links, teacher's corner) presented in different colours. Each icon is clickable and leads to the respective section. Scientific fundamentals are presented in the "research" section. Current research results are discussed in view of a broader and longer perspective in the "context" section. Teachers will find worksheets with tasks and questions for easy use in the classroom in the "activity" section, and helpful guidance on how to integrate the activites in the curriculum in the "teacher's corner". Links offering further information are also given. A suite of e-learning modules (on air chemistry, aerosols, atmosphere-biosphere interaction, emissions, modelling, etc.) is currently prepared. An e-learning module on the use of satellite data to calculate NO2 distributions in the atmosphere has been uploaded on the ACCENT Educational Platform. It has been designed as a stand-alone, interactive textbook; the scientific content is presented as study pages. Students can test their knowledge with a broad range of exercises (gap option, category marker, multiple choice, gapfill, type-in, annotated text). The module also offers a complete scoring and help system with pop-up windows, and glossary definitions. The intellectual property rights belong to the ACCENT Consortium (as defined in the Consortium Agreement signed by each ACCENT Partner). The use of the material is free (for non-commercial purposes). Customizing services are offered by ACCENT T&E (e.g., translation of existing material, production of further material, development of material for specific target groups, on-site and on-line training). Costs to be defined individually. ACCENT T&E also offers a Toolkit for the training of soft and essential skills (inter- and transdisciplinary collaboration, communication, team work and leadership, etc. ), expertise and training workshops (e.g., for the coorperate world). Costs to be defined on an individual basis.